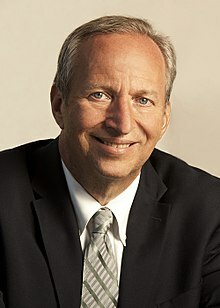 Lawrence Henry "Larry" Summers (born November 30, 1954) is an American economist and the head of the White House's National Economic Council for President Barack Obama. Summers is the Charles W. Eliot University Professor at Harvard University's Kennedy School of Government. He is the 1993 recipient of the John Bates Clark Medal for his work in several fields of economics and was Secretary of the Treasury for the last year and a half of the Bill Clinton administration. Summers also served as the 27th President of Harvard University from 2001 to 2006. Summers resigned as Harvard's president in the wake of controversy over a talk in which he speculated that women may have lesser aptitude for work in the highest levels of math and science. Summers has been criticized by some liberals for the centrist economic policies he advocated as Treasury Secretary and in later writings. Lawrence Summers in: David Warsh (April 20, 1986) "Stockman's Timing Was Never Worse", Boston Globe, p. A1. Lawrence Summers in: David Warsh (April 27, 1986) "It Did Happen Here, Too", Boston Globe, p. A1. Takeovers wouldn't cause the stock market to rise unless there is an upward reassessment of earnings (potential). People are more optimistic and confident about the future. Lawrence Summers in: Glenn Pascall (August 16, 1987) "Raiding Can Be Seen As Wake-Up Call For Corporate America", The Seattle Times, p. B4. Lawrence Summers in: David Warsh (February 11, 1992) "Avoiding Weimar Russia", Boston Globe, p. 37, Section: Business. David Wessel, The Wall Street Journal (April 5, 1998) "Rich now pay more in taxes", Mobile Register, p. F1. David Ignatius (April 12, 1999) "Clinton's Capitulation on China", The Washington Post, p. A23. The situation in a number of countries reminds one that it's still a risky world out there in the emerging markets. Michael M. Phillips, The Wall Street Journal (April 16, 1999) "Global Economic Crisis In Its Last Days", Pittsburgh Post-Gazette, p. C-1. Statement made at World Economic Forum — reported in Muihoong (February 1, 2000) "China trade vote a key test, says Summers", The Straits Times, p. 9. I deeply regret the impact of my comments and apologise for not having weighed them more carefully … I was wrong to have spoken in a way that has resulted in an unintended signal of discouragement to talented girls and women. Apology letter addressed to Harvard University community, posted on his website — reported in Reuters (January 26, 2005) "Summers Regrets", The Australian, p. 032. I know that there is one additional thing that I've learned and that is that what Harvard does and says has an enormous resonance that goes beyond Zip code 02138. Philip Kennicott (April 15, 2005) "The Man in The Ivory Tower - Harvard's Lawrence Summers Is a Study in Controversy" The Washington Post, p. C1. David Ignatius (May 31, 2006) "Watching the Yellow Flags", The Washington Post, p. A19. ...it’s important to remember how fortunate we are as a country to have a currency and a bond market that is seen in every way as a source of strength and it’s a huge responsibility for us to keep it that way. Summers bio from U.S. Treasury Dept. This page was last edited on 11 February 2019, at 21:14.